FOOD International Transfer & Services (FITS) is a unique international food platform to facilitate transnational exchange between producers, commerce, organizations, politics and sciences. We support companies to internationalize their business with a sustainable business development. FITS encourages the exchange of knowledge between different food sectors, at national and international level, and provides the practical support for a successful market entry – overall and connecting the line of business. We want you to enter the German market guided and based on a solid strategic concept and we connect companies and trade partners. 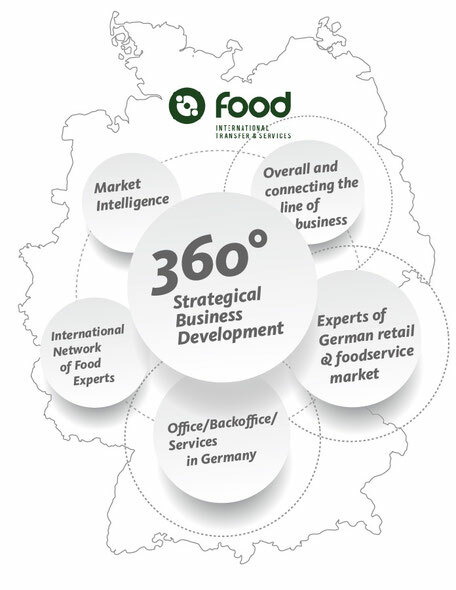 360° Strategical Business Development means: We arrange your market entry moderated, coached and managed, always customized to your market situation and specific needs – adoption of your products to the specific requirements of the German markets. We have an experienced competence team for your individual needs. FITS is the competence centre for the German food market. Book consultancy services from our competence team, get a German address for communication with German trade partners and rent office space and benefit firm in native speaking backoffice –for a sustainable access to the German food market without significant long- term investments.